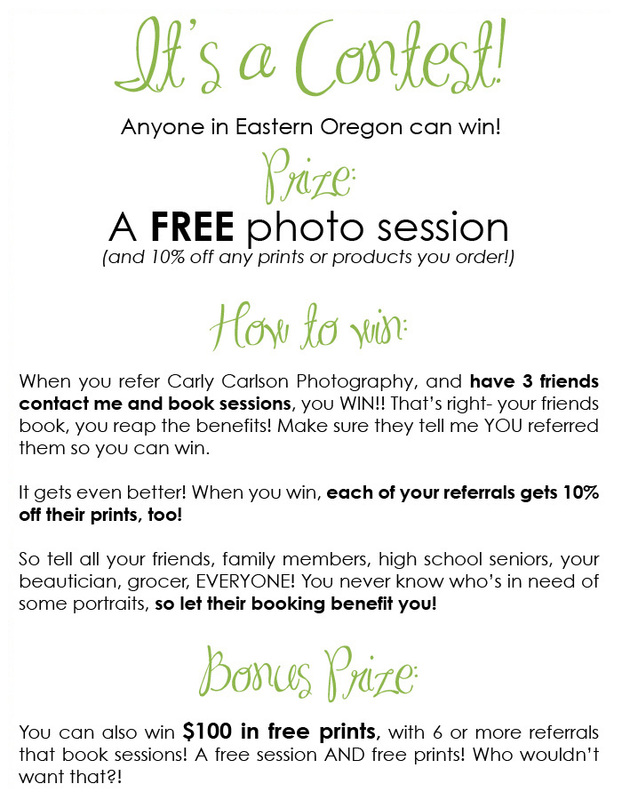 Carly Carlson Photography | BLOG | Baker City Eastern Oregon Senior & Wedding Photographer: Referral Contest!!! Send your friends to carlycarlson.com to see my portfolio and to book their sessions!! Get the word out on your blog, write a mass email, post it on facebook or myspace, or contact me for some business cards that you can hand out! I want you to win this awesome contest! Contact me via email (info@carlycarlson.com) with any questions, and good luck! There is NO limit to how many people can win this contest, so tell all your friends to join in too! If you don't live in Eastern Oregon, but you want a chance to win, contact me for more info on my ambassador program! It's easy, and you'll get a free session, too! Contest will run until MARCH!! !